(CNN) -- Piracy is expected to pick up in the high seas off Somalia after a lull caused by monsoon season, maritime officials warned Monday. 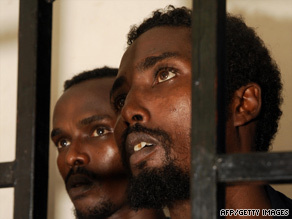 Suspected Somali pirates sit behind bars during the first hearing in their trial at Aden port court on July 15. The Combined Maritime Forces urged crews to take up safety measures, including using recognized transit corridors in the Gulf of Aden and reporting to the European Union's security center before transit. "The prior preparation and vigilance of merchant mariners at all times of day and night is more important now than ever," said Rear Admiral Caner Bener of the Combined Task Force. International forces made up of more than 30 ships and aircraft from 16 nations will continue patrolling the waters to help fight pirates, according to officials. "While our ability to deter and disrupt attacks has improved over time, we are constantly adapting the way we do our business as the pirates adapt and modify their tactics," Bener said. The waters off Somalia are rife with pirate activity, despite increased measures by military forces and shipping companies to ward off attacks. Heavily armed pirates have struck the busy Indian Ocean shipping lanes and the Gulf of Aden, which connects the Red Sea to the Indian Ocean. They have captured dozens of vessels and hundreds of hostages, making off with millions of dollars in ransom. It was unclear whether a ransom was paid. The Gulf of Aden, off northern Somalia, has the highest risk of piracy in the world.